I went this week to the first Lorenzo Reading Series event, all of which I will be going to and reviewing this coming year. For those who don’t know, the Lorenzo Society is UNBSJ’s arts and culture society, hosting events for art, music, and literature. 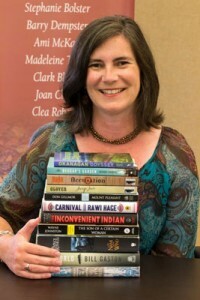 Lorenzo brings authors annually to Saint John from across Canada to do readings, and often the writer will also have a writing workshop. They sponsor the Saint John String Quartet, and are part of the Fog Lit festival (Saint John Readers’ and Writers’s Festival). Lorenzo is also the “Mother Bear” to Vox, UNBSJ’s Student Arts Annual (the website is slightly out of date), the arts publication for visual art, poetry, and short fiction. The readings are somewhat of a riot to go to, I find. There was food, tea, and coffee, and the books from all of the readers featured in the Lorenzo Reading Series this year were for sale out front. There were upwards of 147 people who came to the Morrissey reading, who were still trickling in 10-past-7, when the reading was to begin. All in all, it was an exciting experience. 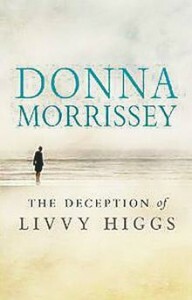 This week, Donna Morrissey was on campus, reading in Ganong Lecture Theatre from her newest novel, The Deception of Livvy Higgs. Morrissey did 3 separate readings from her book, from different sections, and then held a question and answer segment at the end. Unfortunately, I missed much of the reading and questions, as I was helping with the event, minding the tables out front and welcoming in the guests. However, I did have a chance to pop inside a few times and listen to her speak. She had a very strong voice, she spoke broadly and loudly, and she was quite comedic. Between sentences and between her three readings, she tended to wander and ramble, and went on the occasional tangent when answering the questions. The novel didn’t seem to hold up to the hype, but Morrissey’s reading of it was spectacular, with a huge personality to boot. No matter the opinion on the novel itself, one can’t deny the fact that Morrissey was a pleasure to be around and to hear speak and read. If you can, I strongly recommend taking a visit to Saint John for the Lorenzo, Vox, or Fog Lit Festival events.